Our second holiday this year, which had been planned and booked for quite some time, was to Scotland! Wonderful, exciting and enchanting Scotland. A Stranddeko dream destination. We also know that many of our NiBi colleagues have already extensively travelled through Scotland! This might conjure up some nice memories! And for anyone who might be considering Scotland as a destination or hasn’t ever had it on their radar, it will give you some insight. 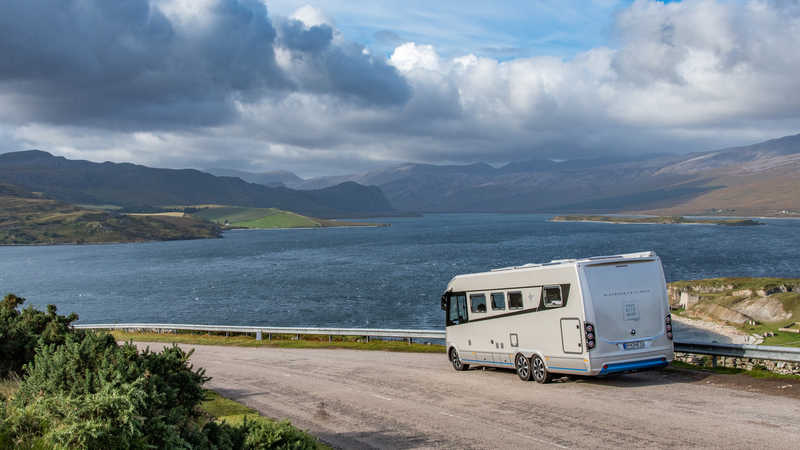 More particularly, it will let you know what it’s like driving a 8.5 m motorhome on the roads, mountains, alleyways and single roads... it works well! 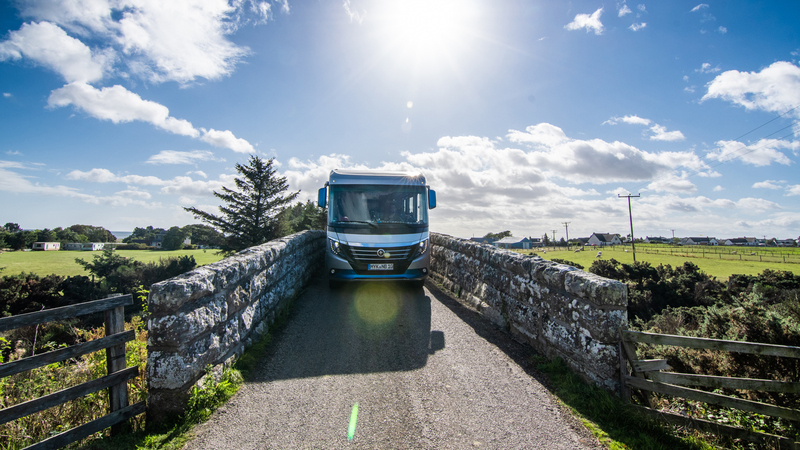 That we can let you know upfront and have had the same confirmed by all drivers in Scotland that quite a few Flairs and Artos have also approved the roads. It was two years ago that we visited Scotland for the first time. 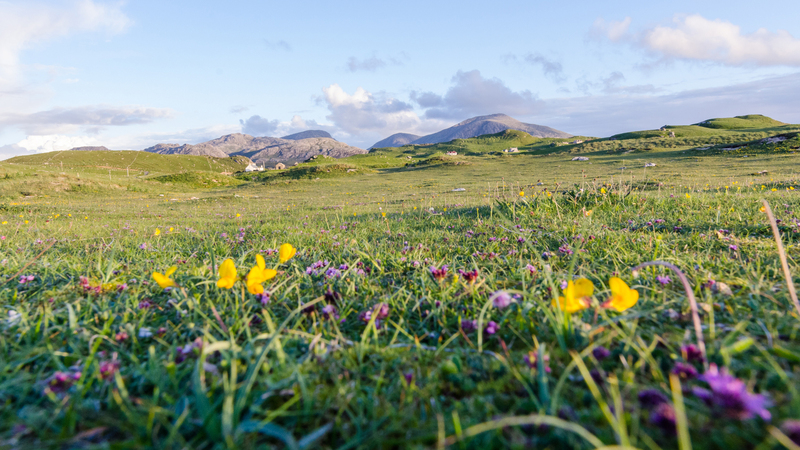 Our trip included the Outer Hebrides Lewis and Harris, Uist and the Isle of Sky. We were already familiar with photos of these HUGE bay beaches. So it was a must for us to go and see them for ourselves!!! And what can we say, it was like we instantly fell in love. The people are easygoing and extremely friendly, the countryside is breathtaking and you can stay the night anywhere unless a sign says otherwise. We officially came down with the Scotland virus. Back then, we were travelling in our Arto 3 “Hooky”. He was 7.2 metres long. Everything was very straightforward and even the smaller ferries between the islands weren’t a problem. 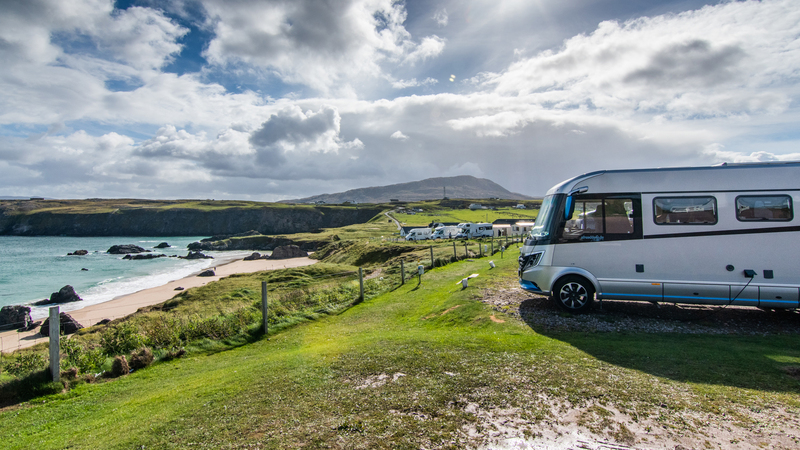 We were extremely anxious to find out how it would be on the road this year in a 8.5 metre twin-axle motorhome. But let’s start at the very beginning of the trip, namely with the ferry crossing. 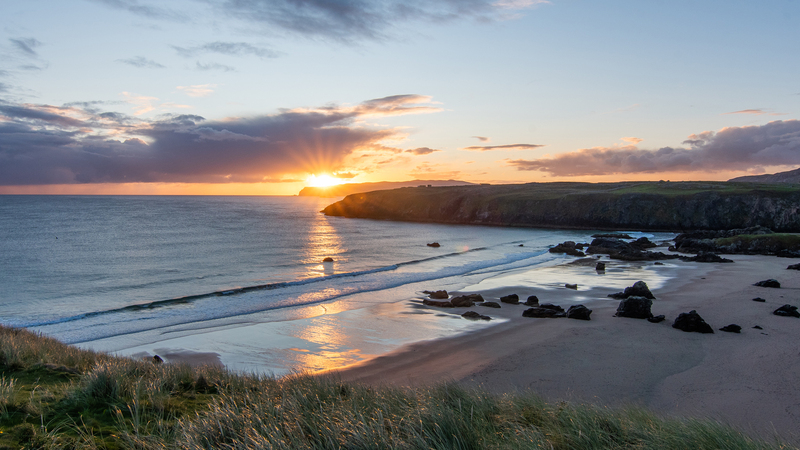 Something we hadn’t realised to begin with was how close Scotland is as a travel destination. 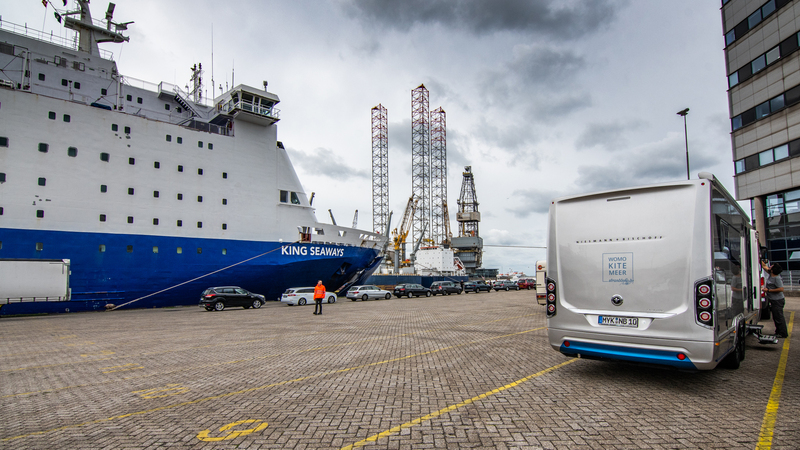 We decided to take a DFDS ferry from Ijmuiden to Newcastle. You drive onto the ferry in the evening, which departs around 5 pm, and you’re in Newcastle the next morning at 9 am. From there, the Scottish border is one hour away. There are faster ferry crossings, but we like being on ships and it took us to the northernmost point possible. Before you can board the ship, you obviously have to book the ferry. Our tip: book as far ahead as possible. The earlier you do, the cheaper it will be. Also look for discounts. There are specials sometimes and ADAC offers a 10% discount for members. Then you should definitely upgrade to Commodore Class: bigger cabins, an upgraded breakfast is included and room service. And in the end, it doesn’t cost that much more if you book early. It’s a good way to go. And to give you an idea of prices: we booked last year in October with a 10% discount and paid 704 euros (round trip). We were a bit cautious about boarding the large ferry on account of Marilyn’s overhang. But it really wasn’t a problem. We drove nice and slow and didn’t scrape anything. After a luxurious breakfast, we were let back onto the road in Newcastle. But we had to go through customs first. It seemed like the customs officers were almost fighting with each other about who got to take a look inside, and Marilyn received lots of compliments. After that, we had to adjust to left-hand driving. It was pretty unsettling at first – but doable. We clearly divided up the tasks. We found it particularly tricky in roundabouts. There are always lanes for specific directions, and as the driver, you just can’t see if the lane is open from the right-hand side. Bo, the driver, kept an eye on the immediate traffic. Frohmi, as the front passenger, gave clear information about the lane, whether it was open and where we needed to turn off. It worked. All in all, you get used to it quickly. We also decorated Marilyn’s cockpit with plenty of reminders. That was after realising that after taking a break and getting back on the road in a holiday mindset, you quickly find yourself back on the right-hand side. 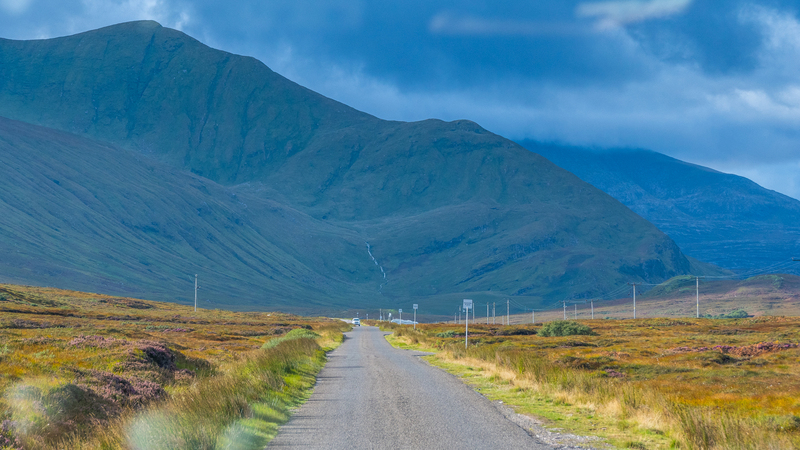 Later on in the more remote Highland areas, you come across single track roads. We love them!!! They have passing places every hundred metres. They’re spots where you can stop and wait until oncoming traffic passes by. You can even squeeze by buses and delivery vans, despite the fact that we almost completely took up some of the passing places with our 8.5 metres. We think the system is a more relaxed alternative to tight two-lane roads. After all, we got to wait in amazingly charming surroundings! We saw lots of motorhomes with standard Fiat chassis and broken mirrors because they’re all the same height. It’s a good thing ours are a bit higher up and even in bright Scottish blue! Something that should also not be neglected is how amazing Miss Marilyn looks in the remote Scottish countryside! People often stopped in awe or slowly drove by. We get lots of thumbs up and compliments about Marilyn on the road and car parks anyway. It really is a lot of fun! On the road in general, we noticed that cars, motorhomes, locals and tourists are a bit more hectic on the mainland roads than on the islands. Time really does seem to go by a bit slower there. Diesel is more expensive than petrol in Scotland. I think the most expensive price was 1.60 pounds (approx. 1.80 euros) way up north in Durness. They were actually out of diesel for a couple of days there! That can really make your heart miss a beat! Fortunately, a new delivery came the next day and we had planned to stay for two days anyway. Even though there’s a good network of small petrol stations, we now keep at least 150 km in the tank at all times. We only had 70 km left on that day. That would have definitely not been enough to make it to the next station! Depending on the degree of remoteness, food costs a bit more, but is generally quite close to German prices. So we only packed a few basic foodstuffs in our motorhome to start and got the rest from well-stocked English supermarkets. You also usually get some friendly small talk about the weather for free. The people are so incredibly friendly here!! We ended up at campsites pretty often. We paid between 20 and 38 pounds. It’s probably more during the peak season. That’s based on the location (right by the sea or close the city in Edinburgh), and then you have the Caravan Club. 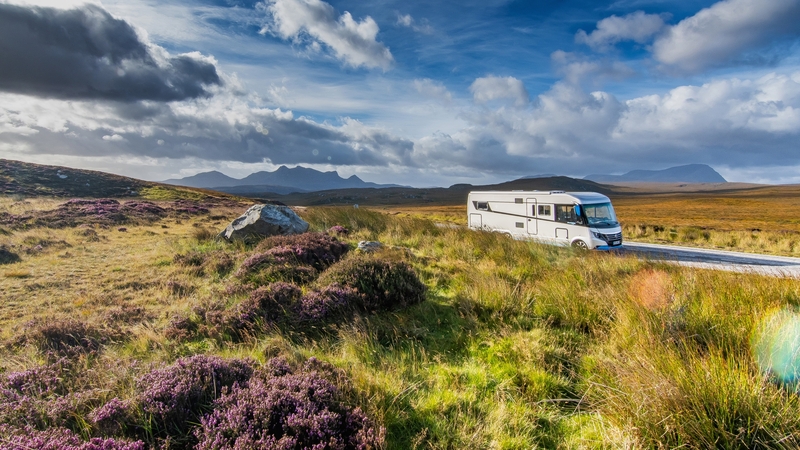 If you plan to stay at campsites on a regular basis, you should definitely become a member. If we hadn’t been members, a pitch would have cost 32 instead of 12 pounds! Ouch! But as mentioned earlier, you can also park wherever you want. 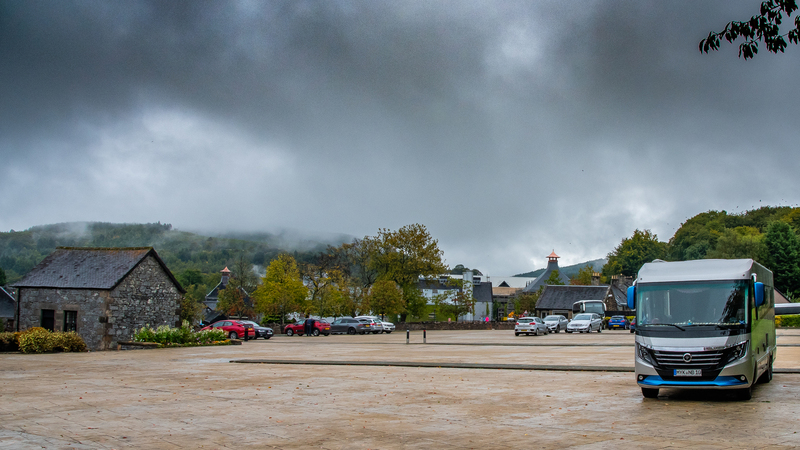 In areas that are more inhabited or with lots of tourists, you often encounter car parks with “No overnight parking” signs. We always respect that. 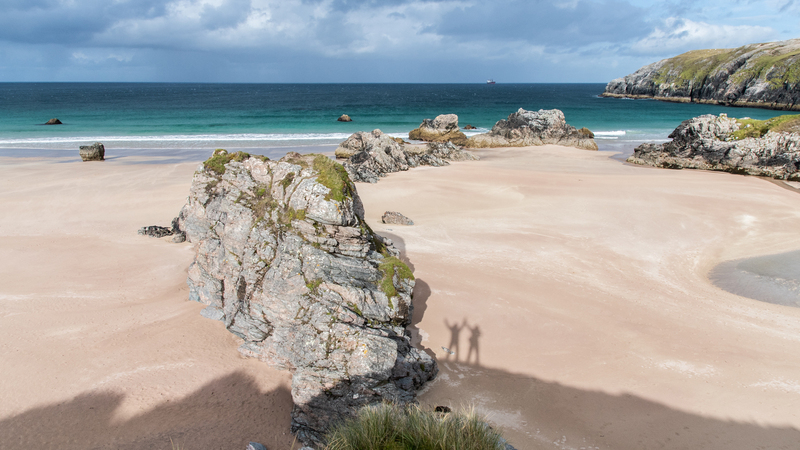 You often find hiking car parks or beach car parks that are a great place to stop. For instance, we like to sleep near lighthouses (what a surprise ;) ). We were practically blown away there, so we preferred to hide out at a campsite to have a break from the wind. We’re not too keen on staying at forest car parks. There’s a reason we go by the name Stranddekos (Strand is German for beach) ;). 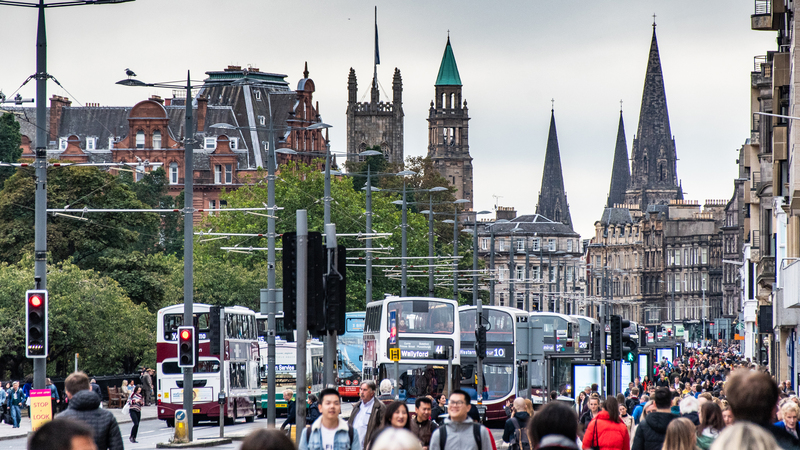 The best time to travel in Scotland is more of a philosophical question. The classic time is May and June. 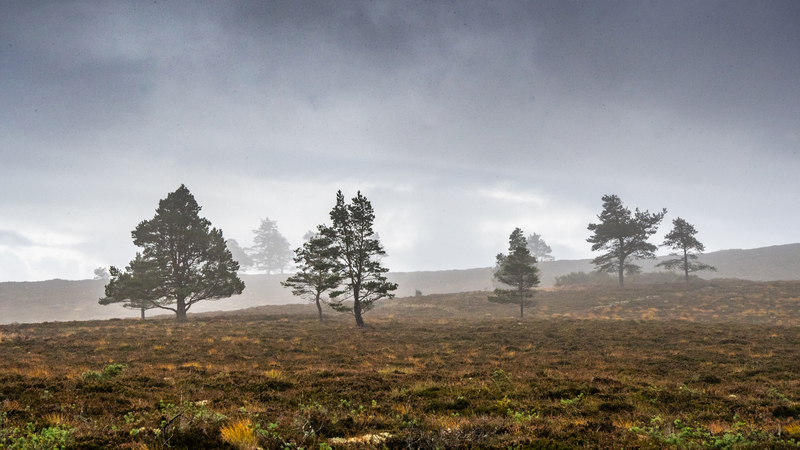 It’s the early season, the days are long and the midges aren’t out yet. Everything is in bloom and insanely colourful and green! 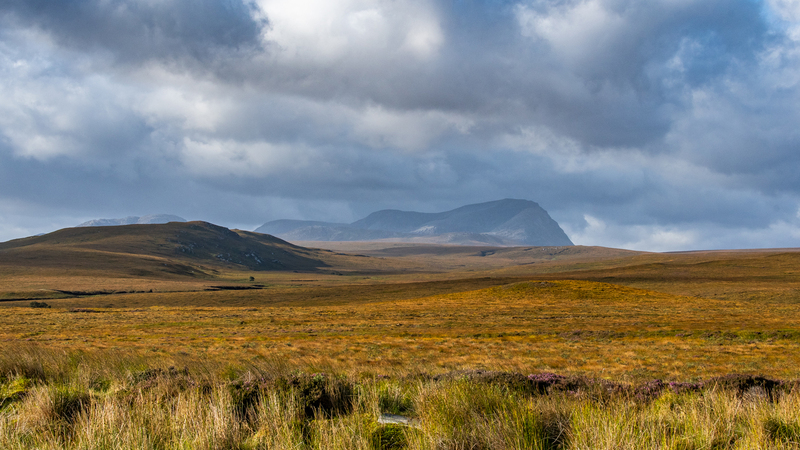 For a change of pace, we planned our second Scotland trip for autumn. We were on the road during the second and third week of September. As our camera expert, Frohmi had hoped to shoot lots of mystical photos with fog, but the wind whisked those hopes away. It was very, very stormy. The wind speeds were up to 8 or 9 practically the entire time. At the end, we even had the first autumn storm to receive a name and wind speeds up to 11. But we were also able to marvel at what seemed like at least five rainbows each day. Gorgeous! 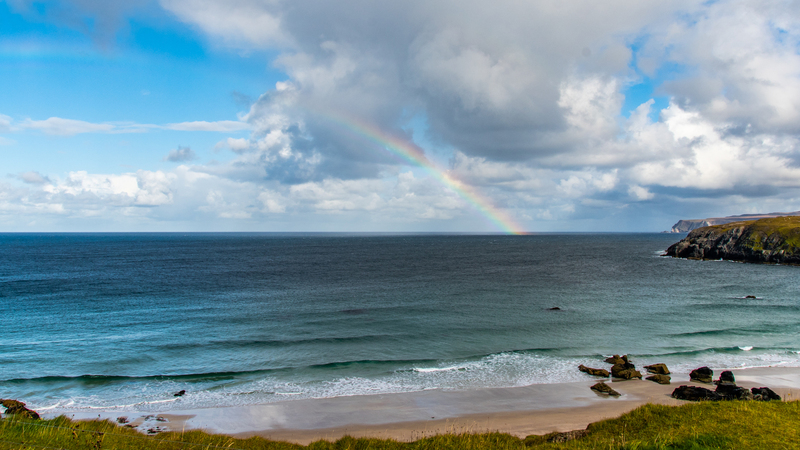 And even if it’s raining, which it does time and again, this country offers an unbelievable explosion of colour that completely fascinates us. And that’s also exactly the kind of weather we love! Stormy squalls that cast over the sky, gigantic cloud formations, tousled hair, the wind all around you. We had two weeks of our favourite weather! The wind, the wind, the heaven-born wind... was actually our dearest companion. The weather forecast for the first week was what caused us to take our plan B route. 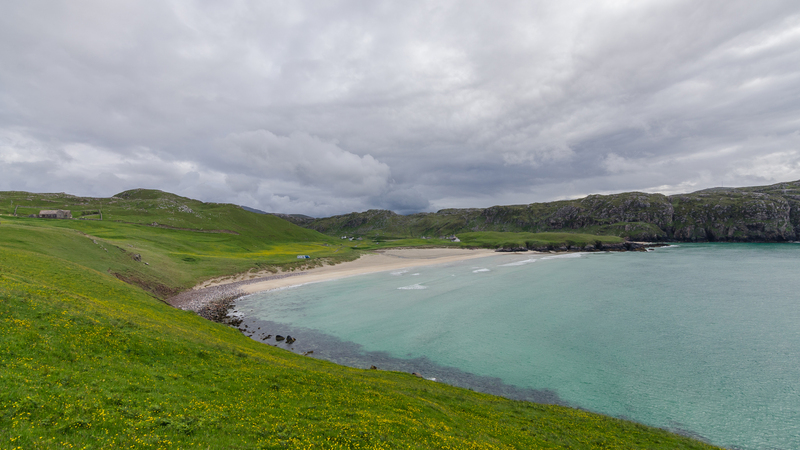 We originally wanted to go back to the Outer Hebrides to visit the fantastic kiteboarding beaches. We had two weeks for our holiday, and the first week was already entirely forecast with wind speeds from 8-9. After an extremely wobbly trip on the big ferry, we didn’t really feel like taking another amusing sea journey. Unfortunately, there was also too much wind for kiteboarding. We also knew there aren’t many spots where you can hide from the wind on the islands. But that’s why you have a plan B; to use it. We took the North Coast 500. The road, which is approx. 500 miles long and far up on Scotland’s northern peninsula, has been advertised to tourists for a few years now as: THE ULTIMATE ROAD TRIP. Exactly! How right they are! 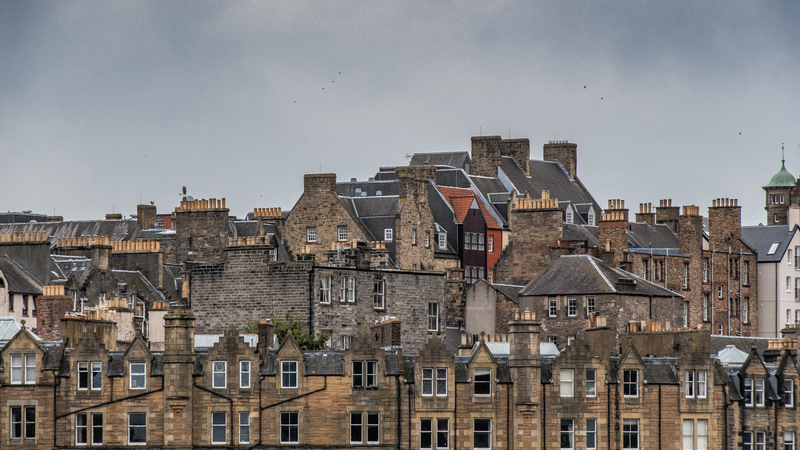 We then headed over to Speyside, the home of single malt whisky on the east coast, and finally to Edinburgh. In total, we drove 1800 km in Scotland. We enjoyed every possible moment of the stormy weather! In general in Scotland, we have to say that it doesn’t actually matter where you’re headed. There are wonderful views and exciting roads everywhere. This country and especially this route are so amazingly diverse for such a small area. Sometimes you feel like you’re in Sweden, then in Norway and then suddenly Middle-earth and the Shire. 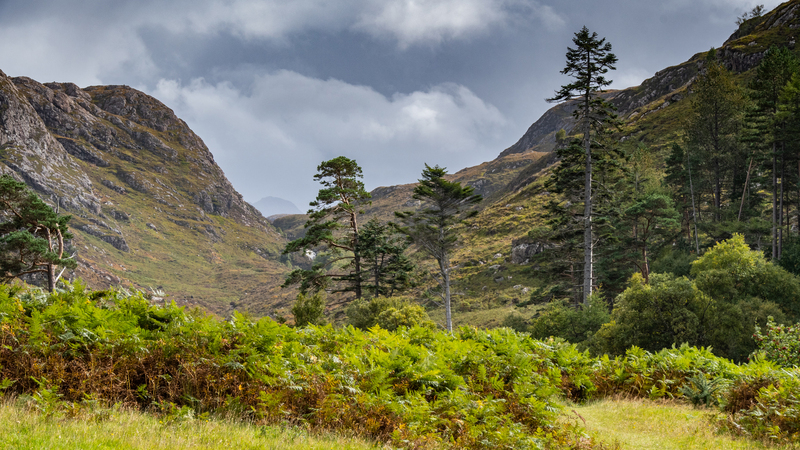 Impressive towering mountain landscapes, boggy plateaus, windswept cliffs and sheltered bays with white sand beaches. The only problem is not being able to take an even closer look at every kilometre. So we took the NC500, according to a shortcut, counter-clockwise. That means you turn off to the right from Inverness and follow the main road on the coast up north. We spent the night in Brora at the Caravan Club Site, which had a very adventuresome access road. But we were certainly not the smallest to have driven on it. Oncoming traffic and those behind us waited patiently until we guided Marilyn over and photographed it all, gave a friendly wave and off we went! The road runs parallel to the coast and offers beautiful, far-reaching views. Everything is signposted extremely well. You pass by quite a few sights, such as Dunrobin Castle. We decided ahead of time, however, to not visit the things we already knew enough about from brochures. In two weeks, we wanted to take in as much nature as possible. 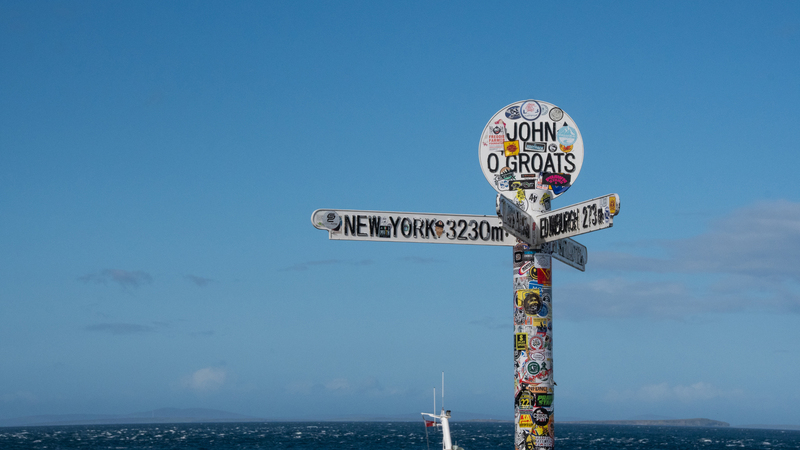 The first spectacular highlight was way up north on the next day; John o’Groats, the northernmost point on the British mainland. 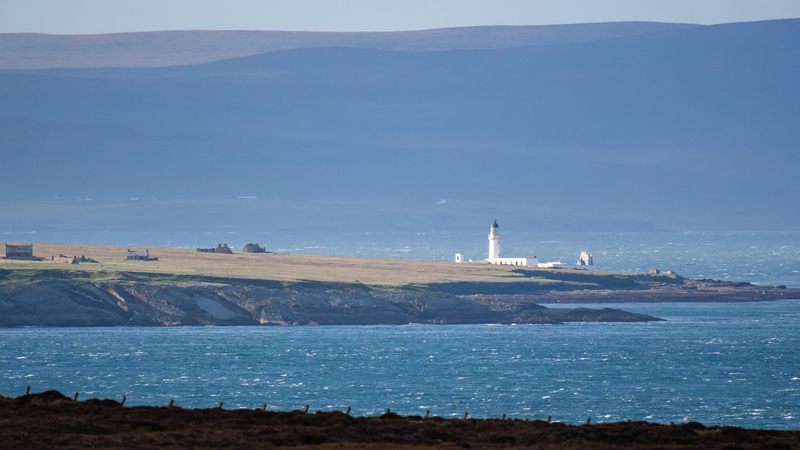 You can take day trips to the Orkney Islands from there and also see them on the horizon. You rarely find any of the sign posts that are so well known from photos without other people around. We also explored the quirky shops there. There’s something for everyone. We picked up a Scotland flag for Marilyn; it suits her well. And Frohmi finally got her super-detailed maps. They’re actually a big help for when the cell phone network is down; plus they’re fun! 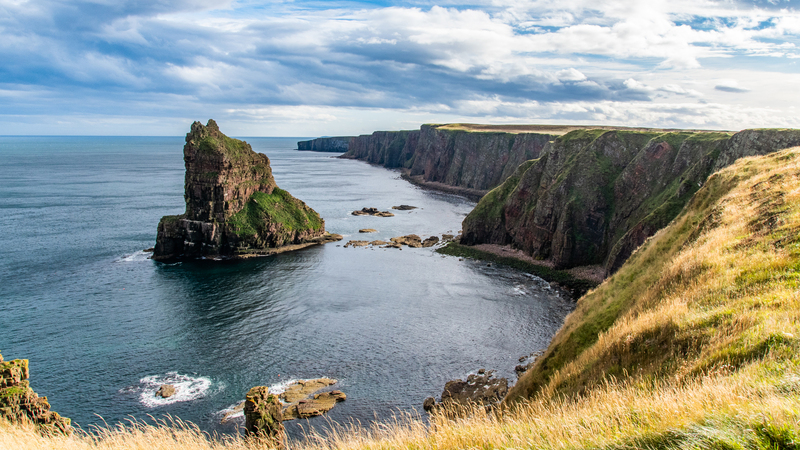 Two kilometres to the east, Duncansby Head beckoned us with its lighthouse car park and an excitingly different type of cliff with sea stacks. That became our nighttime parking spot. 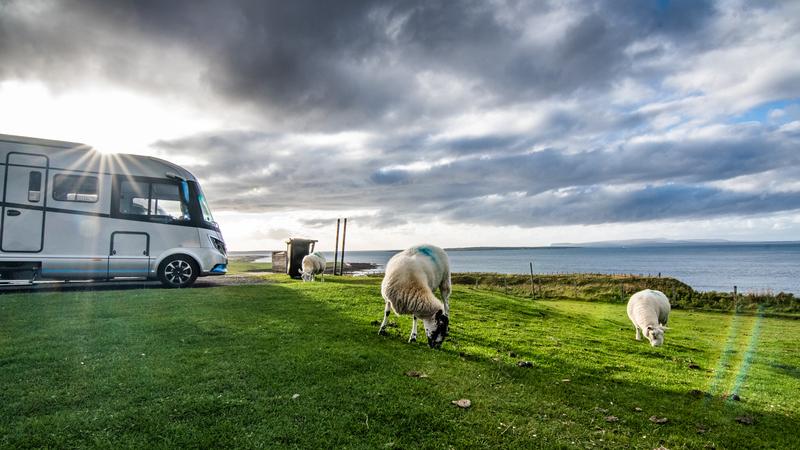 After all, you have sheep wandering right in front of your motorhome there! 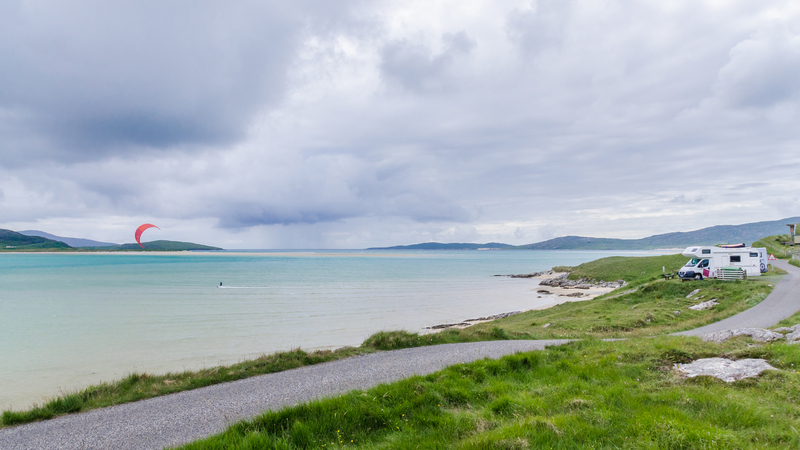 You also have a sweeping view of the Orkney Islands. Perfect, right? But before that, we let an Englishwoman drive us a bit mad after she told us there were jumping dolphins on the other side! We put on our hiking boots, packed the camera and took off! Unfortunately, we didn’t spot any jumping dolphins. But we did see some amazing nature and seals. The heaven-born wind then drove us away from the awesome view and we set up camp on a very nice campsite that is also located by the sea at John o’Groats. We then wandered along the coastal road over the next two days. We found big beaches and little beaches. Unfortunately, the wind and weather was not suitable for kiteboarding. That was too bad. But the magnificent nature quickly consoled us. We found high mountains and wide expanses that vary so quickly that you can hardly digest what you saw just five minutes beforehand. 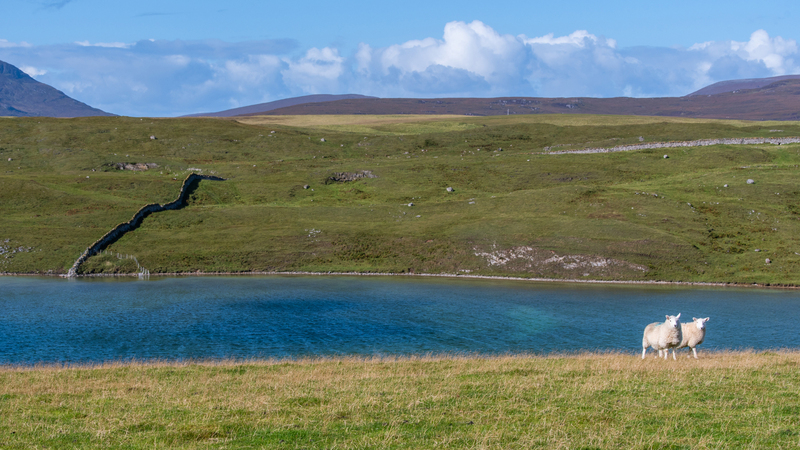 Perhaps the most Scottish place we stayed was on the Kyle of Tongue; an estuary with a view over grazing sheep, an old cemetery and rugged mountains. Perfect for a whisky tasting evening! We finally restocked our whisky bar after taking off from home without any of the golden drink on board. Which makes sense. You wouldn’t bring sand to the beach with you! 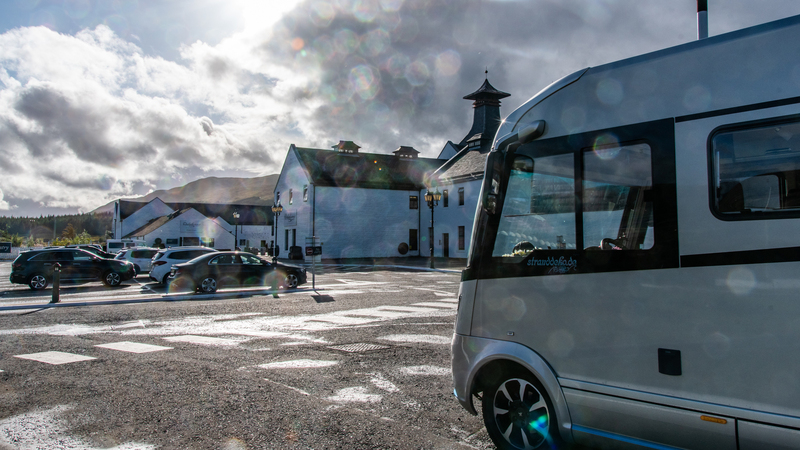 A Dalwhinnie had already made its way into the motorhome on the first day of the trip. The distillery at the highest elevation in Scotland. We also came into possession on an Old Pulteney from Wick and a Wolfsburn from Thurso from a small, charming drinks shop in Thurso. Beautiful Scottish gold! Cheers! Slàinte! 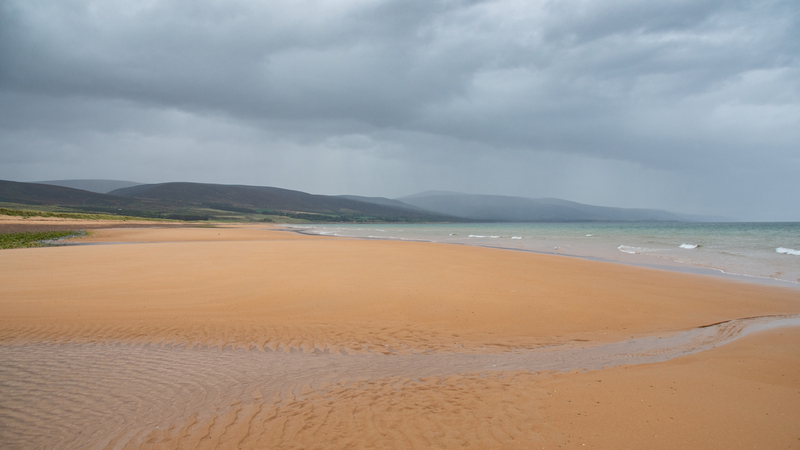 It seemed to us that Durness had the super-beach. And if it held its promise, we planned to stay for two days. Just to be there, hang out and take it all in. After all, we’re not here just for fun!! We got a pitch with a view at the campsite. Lots of pitches were reserved and the whole site was full by the evening. 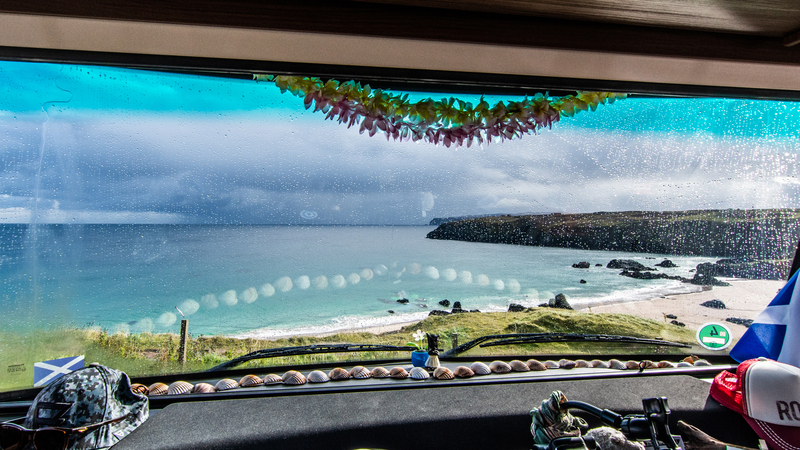 From our Arto theatre, we had a view out over the bay. We could watch the falling and rising tides and perfect little waves. Saw the rain showers come and go, rainbows included. With the rising tide, we could see the seals playing in the waves and hunting in the crystal-clear water. You couldn’t look away! Not possible. We took it all in until it felt like our eyes would fall out of our heads. And with a glass of good whisky in your hand – what more could you want? headed to the Marilyn Bar and watched the waves. We then headed south down the west coast over the next two days. 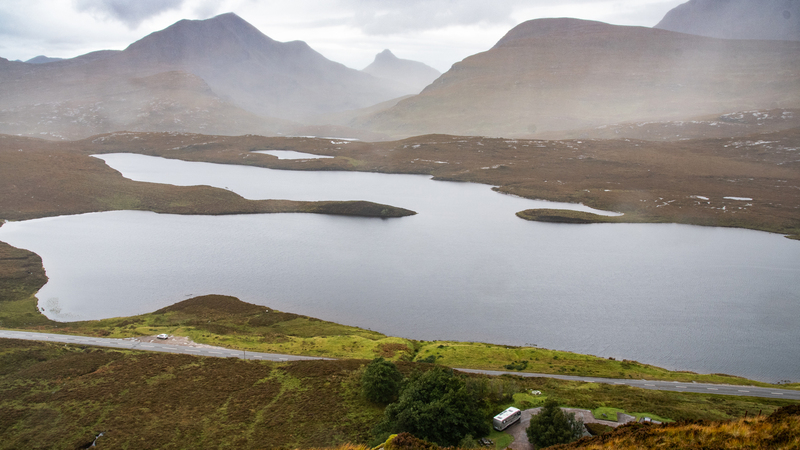 The area from Ullapool to the Isle of Skye is called Wester Ross. There’s no way the similarities to names from Game of Thrones are a coincidence. Sometimes you feel like you’re driving through a film set because the surroundings look so wild and surreal. And if we find ourselves in the mountains, then hiking is on the agenda. 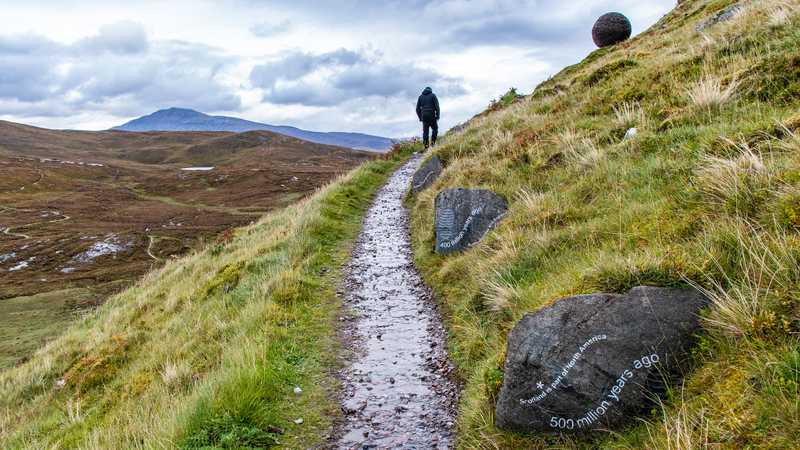 We found a lovely and informative little hiking trail at the info centre in the Knockan Crag National Nature Reserve. In addition to amazing views, you can also learn a lot about geology! Further south, at what felt like the 200th bay, we spotted a waterfall at the end of a valley. Plus a beaten track along the river. After an hour of jumping over lots of rocks and lots of water, we made it there. It was seriously loud!! What a beautiful valley we hiked through. The way back was also breathtaking with a view over the stormy sea. But make sure to have waterproof shoes! And there you have it, our north coast adventure had come to an end. We needed seven nights for it all. It could probably be done in less time, but it would definitely be better and advisable to have more time! We had one more item on this year’s Scotland wish list. We really wanted to drive through Speyside. The home of single malt whisky. The Spey is a river which gave the region its name. It’s where you’ll find the highest concentration of distilleries in the whole country. That’s easy to figure out based on the number of characteristic brown signs for tourist attractions. If you were to stop at every distillery, you would have a quite a lot to do :). So that means you have to narrow it down. As some background information, we should add that we fell in love with the delicious Scottish drink just two years ago. It was after visiting a very small, family-run business on Lewis and Harris that we became fascinated. So we thought the next place for us to visit is THE global player on the market: Glenfiddich Distillery. 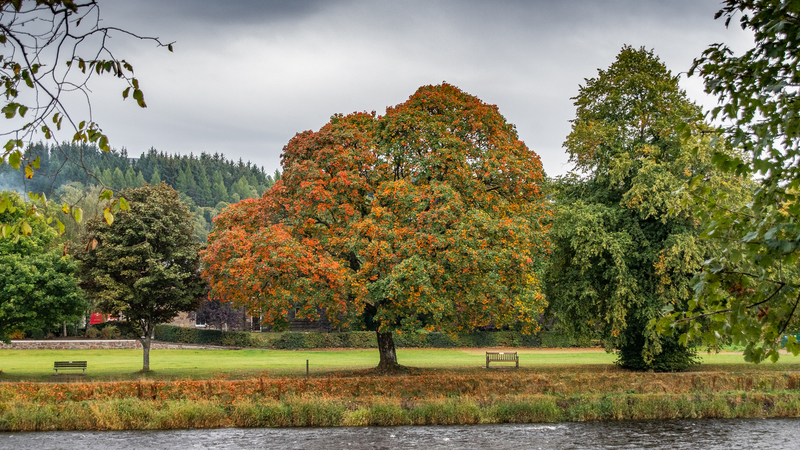 We spent the night in Aberlour at a quiet car park right beside the Spey. 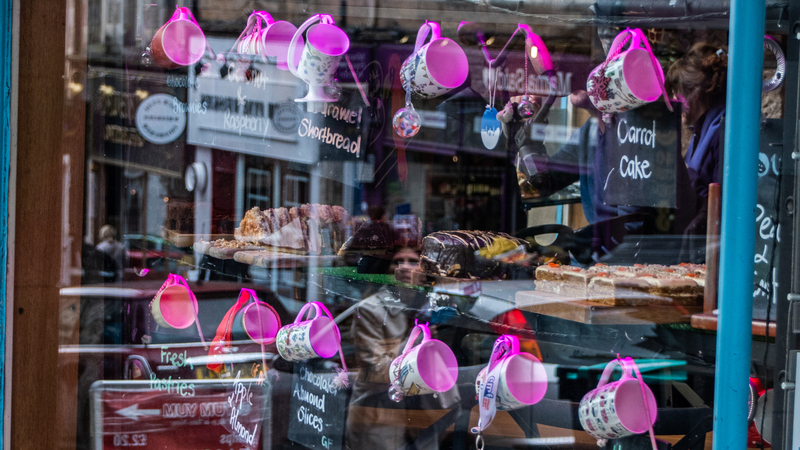 The town has the Aberlour Distillery (make sure to make reservations for a tour) and the Walkers Shortbread factory shop. Biscuit heaven!!! The tour of the Glenfiddich Distillery is informative and interesting. The shop is a great place to browse and admire bottles, and you can have an ample meal at the on-site restaurant. Stag antlers are omnipresent. What we did realise in the end was that their whisky doesn’t taste as good to us compared to others. If you’re going to have whisky, then with a peaty taste. We went to four distilleries during our trip. Something we quickly noticed was that each one tries to stand out by emphasising a unique selling point. 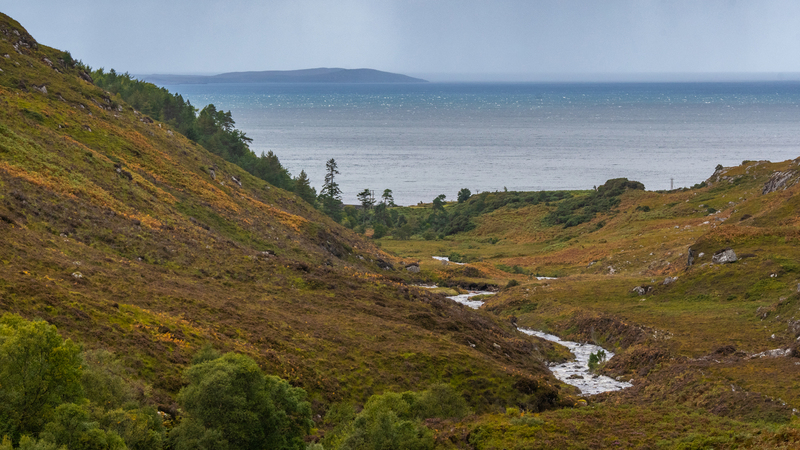 Dalwhinnie is at the highest elevation, Wolfburn is farthest north on the mainland and Glennfiddich has its own river. We noted that with amusement and were always interested to find out about the next distinctive feature. During the first two days, we always turned off the road after spotting a distillery sign. We then quickly realised that we weren’t really making any progress that way and had to (unfortunately) stop. We would like to thank the nice lady from Dalmore who let us know we could go ahead and buy whisky in Germany as the price is better due to lower taxes. That dampened our plans to buy souvenirs a bit, but not completely :). The wind, which really gave us exceptional weather in the end, continued to push us along. In this case, it swept us to our next plan B. We would have liked to slowly potter down the east coast back to Newcastle. But the full-blown autumn storm “Ali” was forecasted to arrive with wind speeds up to 11. Even with our twin axles, we didn’t want to have to be on the road in that. So the next plan B was to head towards a campsite in Edinburgh, wait out the storm and then tour Edinburgh on the last day of our holiday before driving back to the ferry. Also a good plan! We decided on the Mortonhall Caravan + Camping Park as our campsite. 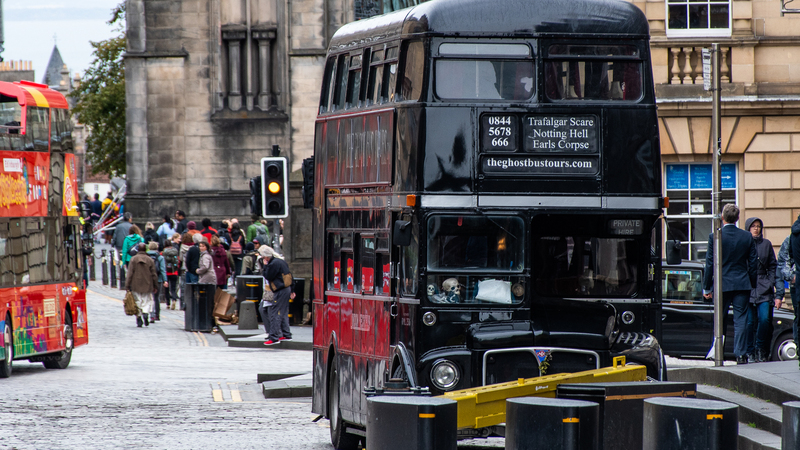 It’s centrally located and the bus takes just about a half hour to reach the city centre. 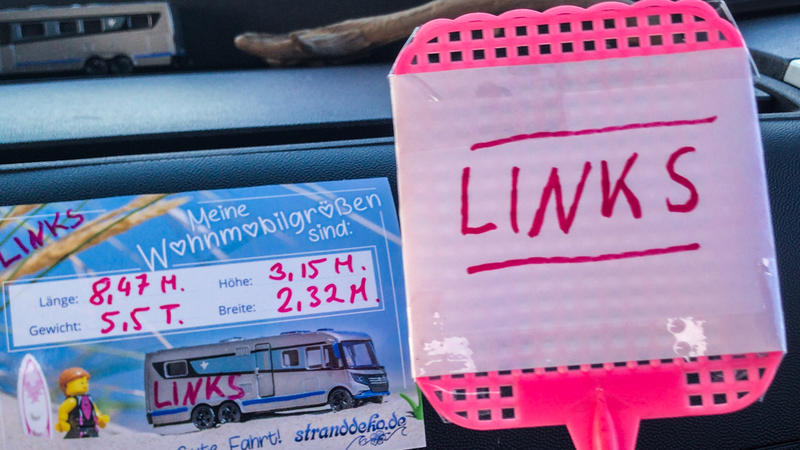 We had to pay a surcharge for the length of our motorhome. We accepted that with amusement and were happy to have a safe spot right as the storm hit around midday. Shortly after that, pretty much every bridge and the like were closed off and we made ourselves comfortable in Marilyn. 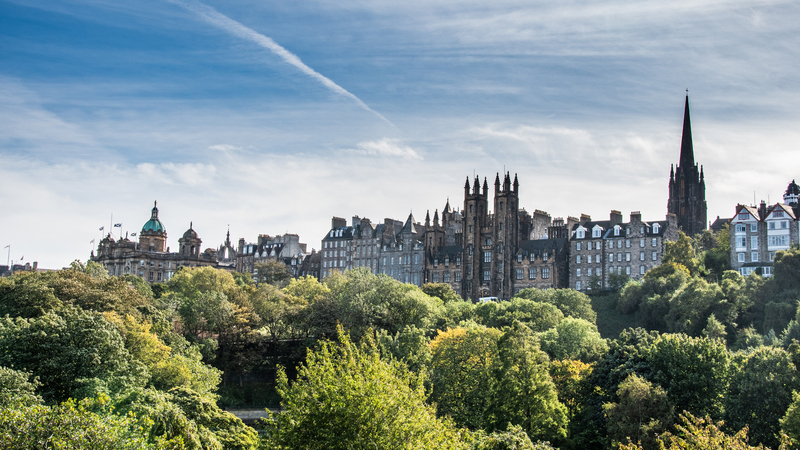 We would completely and absolutely recommend Edinburgh. If you imagine the city without the crowds of people, you feel like you’re on the set of a historical film. 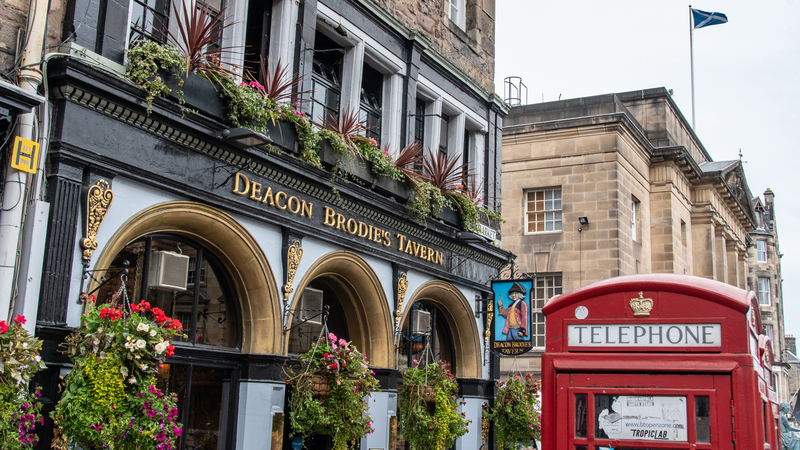 We spent an afternoon wandering from Princess Street to the castle, then over to the Royal Mile and down to the Palace of Holyroodhouse, and then back up to the Nelson Monument and finally back to Princess Street while trying to soak up as much as possible. For a more thorough visit, you should plan to have at least two days! 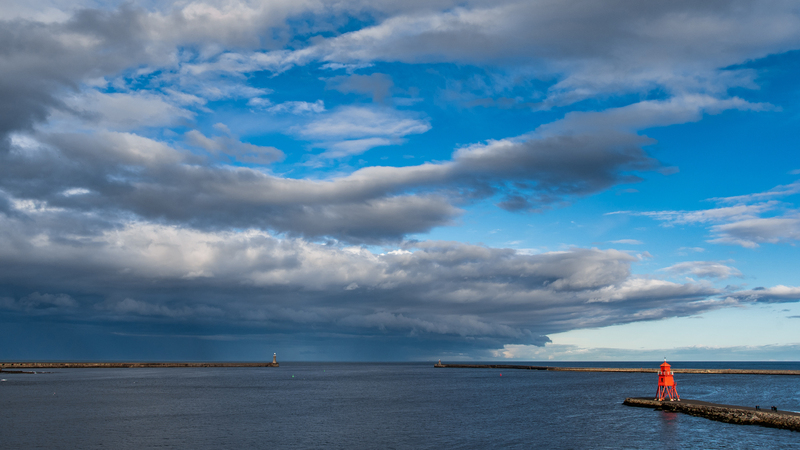 After two weeks of ultimate road trip goodness and riding out storms, we got back on the ferry in Newcastle and bobbed our way back to Holland. 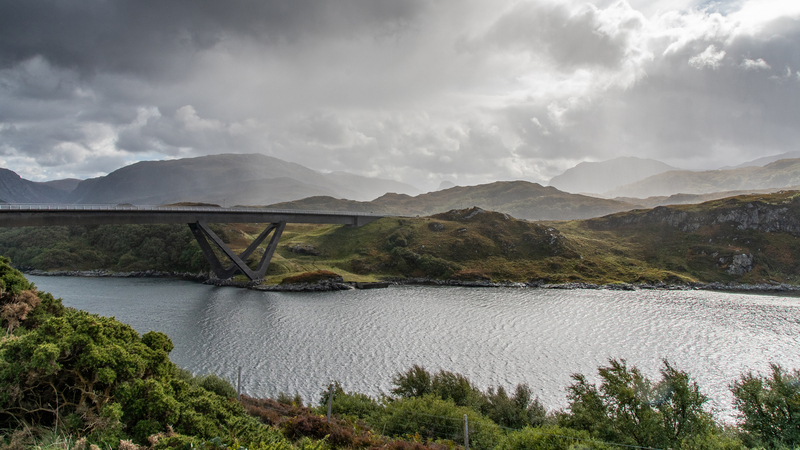 For two weeks, Scotland showed us its wild and stormy side. Even that was gorgeous and we’re ready for more! Goodbye and until next time! 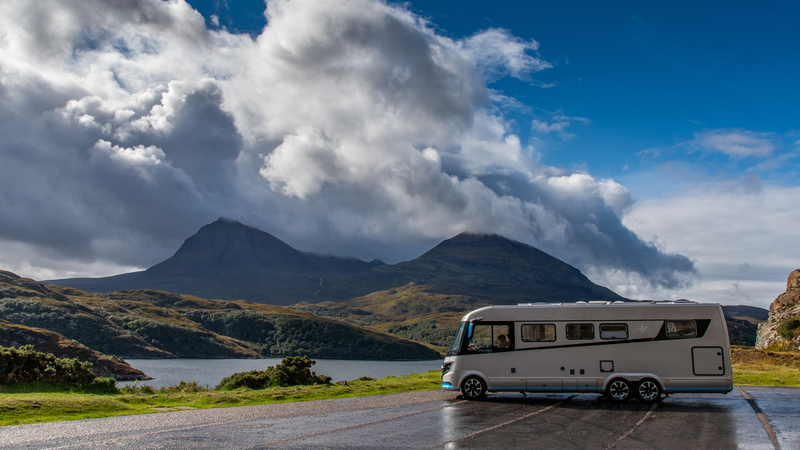 Our synopsis on driving our twin axle Arto in Scotland: in the end, we actually didn’t fit everywhere, but we wouldn’t have had that problem with 7.2 metres and two axles. For example, on normal parking spots with the overhang to the back over the parking bay. But that has nothing to do with the country. That’s how it is everywhere. What’s important is that we really never felt like we were limited. Even on small roads or when turning. That’s what makes the twin axle vehicle so surprisingly trouble-free for us. 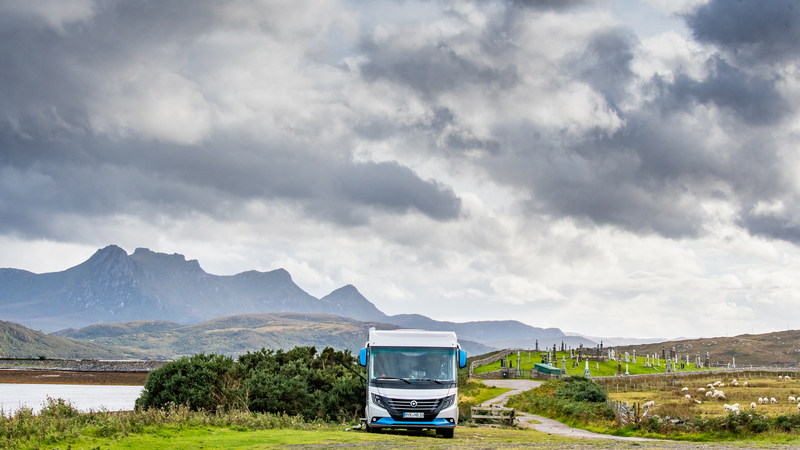 And the driving comfort it offers, particularly in such stormy weather, is second to none in our minds! And you really do grow with each new task you face :) you just have to give it a go. 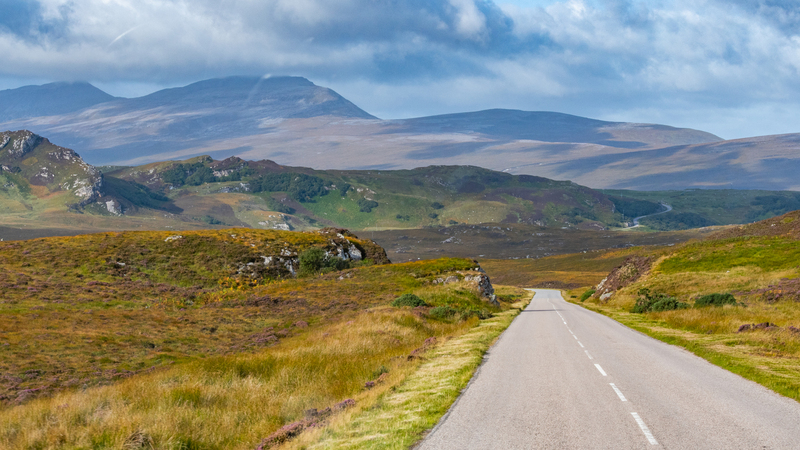 In general, there’s always plenty of room in Scotland and there are pastures to the left and right of the roads. 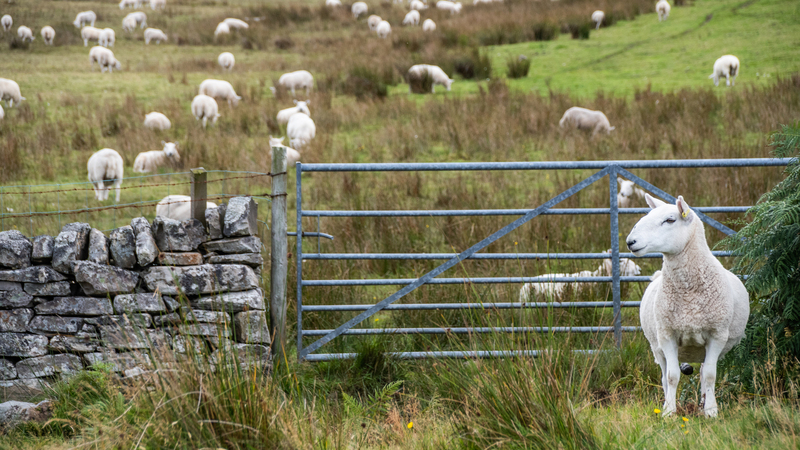 You basically never encounter tight hedgerows or stone walls that are too close. So what can we say about Scotland? 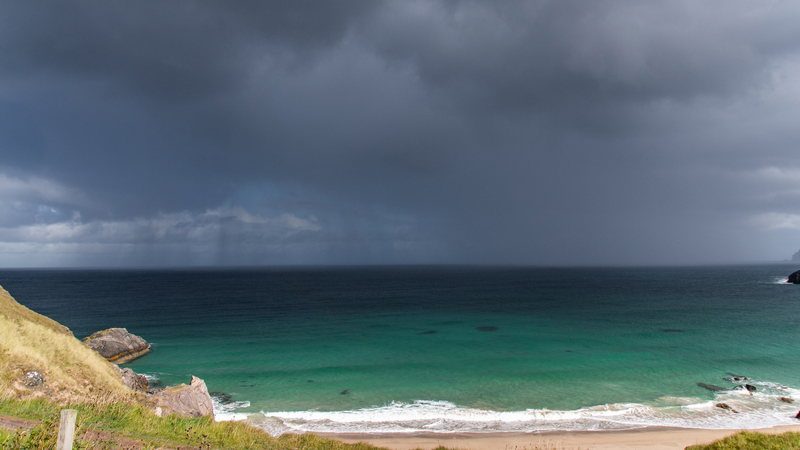 How can we possibly capture such a stormy and enchanting little part of the world in such a short story? It’s just not possible! You just need to visit for yourself.